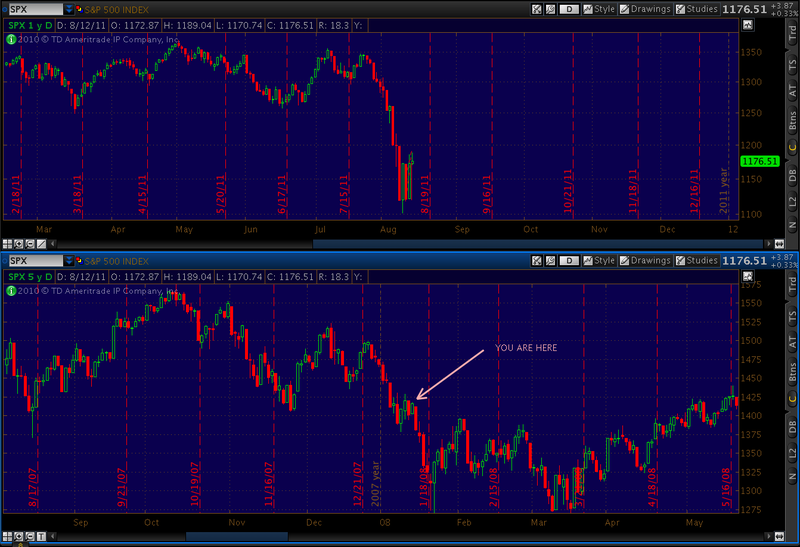 I’ve been undecided about one aspect of the 2007=2001 pattern for most of the past week. The price drop we’ve experienced is obviously much greater in percentage terms than in 2007. Yet, the pattern of chop we’ve seen is exactly the same. 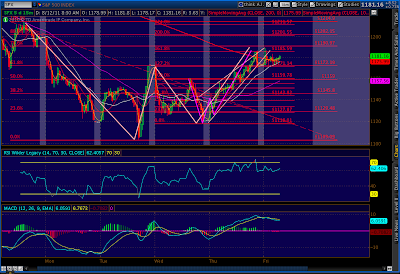 Throw in the harmonics patterns I discuss below, and I think we’re on the cusp of another big leg down. I’ve been expecting it to happen this afternoon, but maybe it’s not until Monday. For those of you looking for an exact date, think late in the day on January 14, 2008. 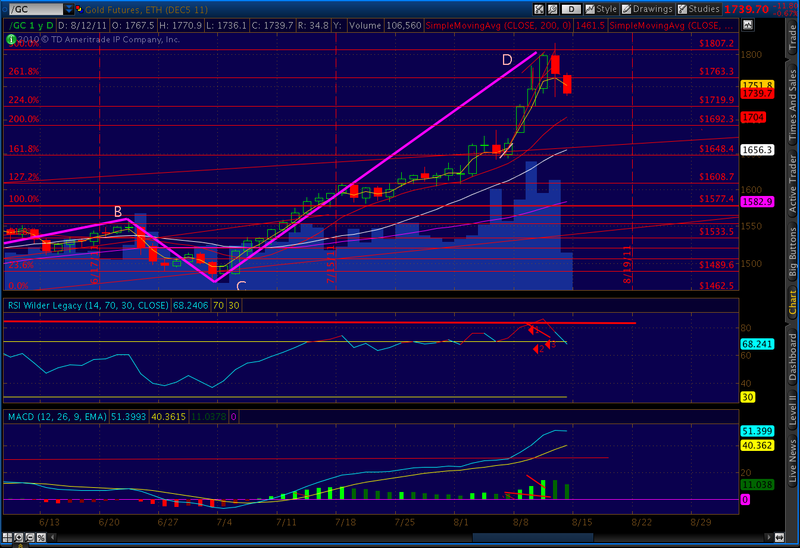 I realize it’s not terribly obvious from the daily chart, which still looks a bit on the oversold side. That’s the only thing keeping me from being 100% certain. But, the shorter term charts are shaping up nicely. 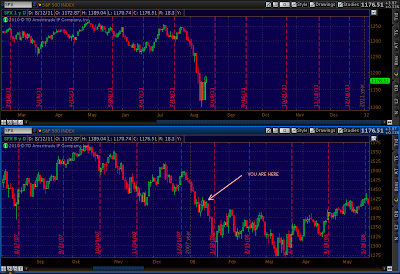 There’s also a nice divergence between the rising prices and falling volume. 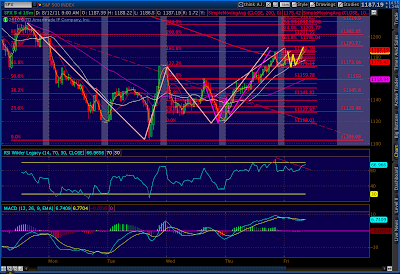 Gartley, Crab and Butterfly (adding here in yellow) all completing at 1186-1191…could be big! 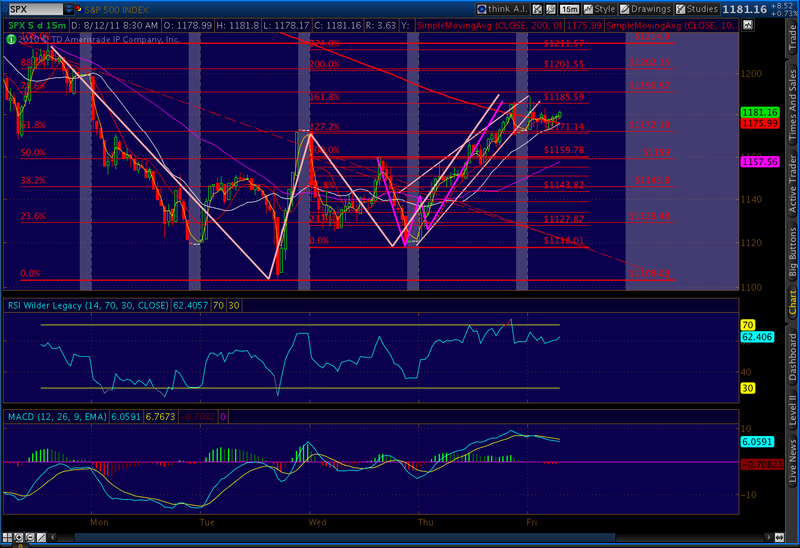 The .618 XA retrace on the Gartley would have been 1172.19; SPX hit 1171.77. 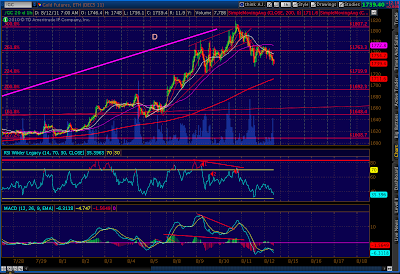 The .786 CD leg should have hit 1190.97; it hit 1188.64. The 1.618 extension on the Butterfly indicated 1185.59. These are very precise patterns, and in this case they were nailed. As I always say, there’s no guarantee on these; they’re right about 70-80% of the time. But, when I see two very well-formed patterns nestled one inside the other, it’s a very good indicator that 1190.97 will not be exceeded today in any meaningful way. BTW, it’s interesting that this tug-of-war is happening at the same price level as a large gap formed on December 1, 2010. 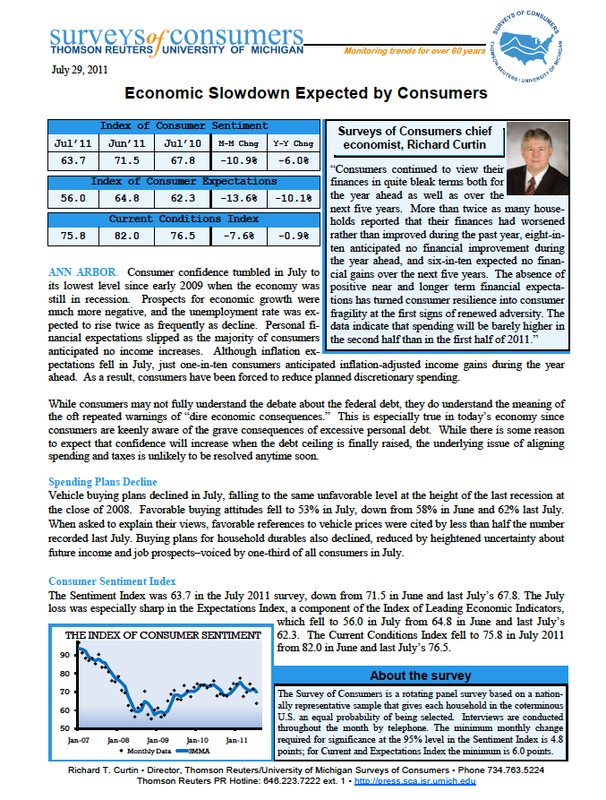 Here’s the Reuters/Univ of Michigan Survey of Consumers press release. Pretty dreadful. 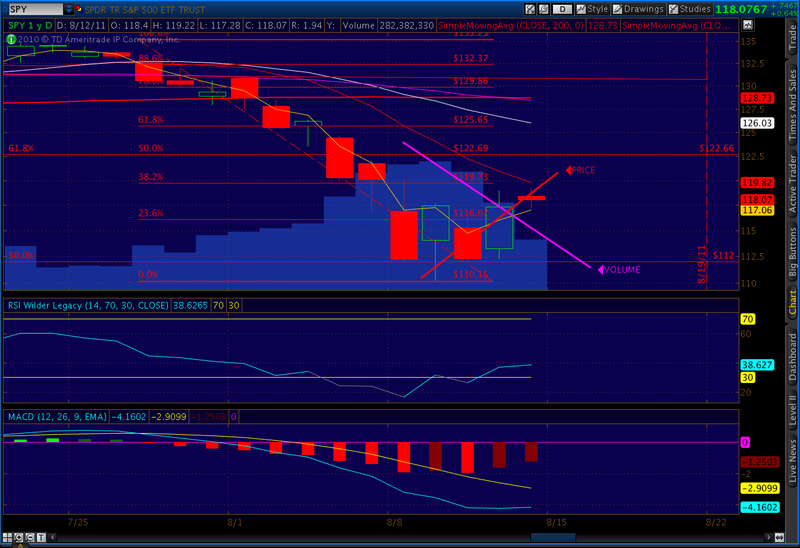 Gold is off 11 so far, but the potential is much greater. A reminder: the Butterfly pattern that completed a couple of days ago [see: All That Glitters] calls for a minimum .618 retrace of the DA leg. 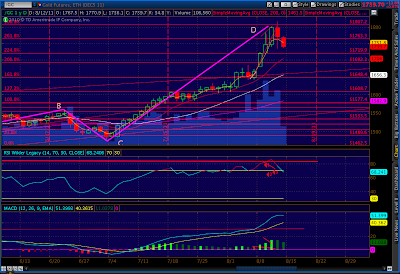 While not guaranteed to happen, it’s worth noting that such a mild retrace would take prices down to 1506. 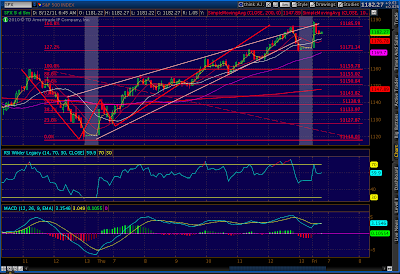 A typical 1.618 retrace would indicate a downside of 1250. 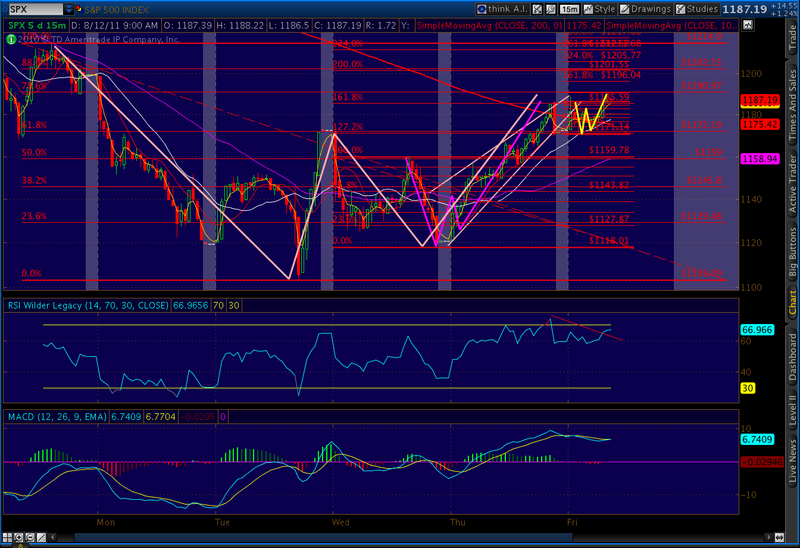 SPX completed a bearish crab pattern yesterday at the 161.8 extension. It also completed a rising wedge pattern, reaching about 80% of the way to the apex. Both contributed to the 16-point reversal at the end of the day. 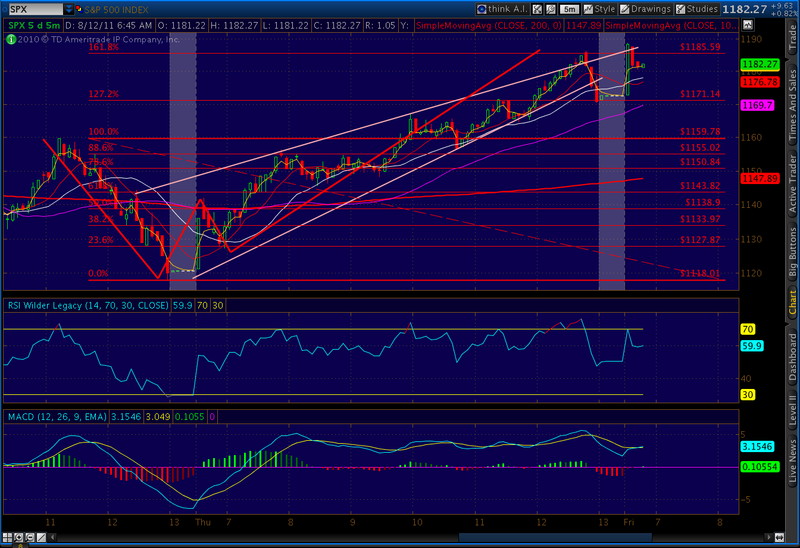 I’m viewing this morning’s run up as a backtest of the rising wedge until proven otherwise. If the crab plays out, we should give up the 14 points we just gained and then some. 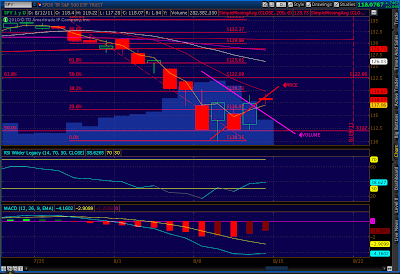 The crab argues for a return to at least 1138 (the .618 retrace) and possibly the 1.618 extension at 1076. I think we will likely see a whole week of selling next week commencing from 15 Aug 11, Monday. Just like on the eve of 15 Jan 2008. My reason is there will be waves of heavy selling arising from this margin increase announcement affecting most of the world markets starting 16 and 17 Aug.
Like your work but every one of my charts triggered a buy today so we shall see. Looks bullish to me through Tuesday at least. 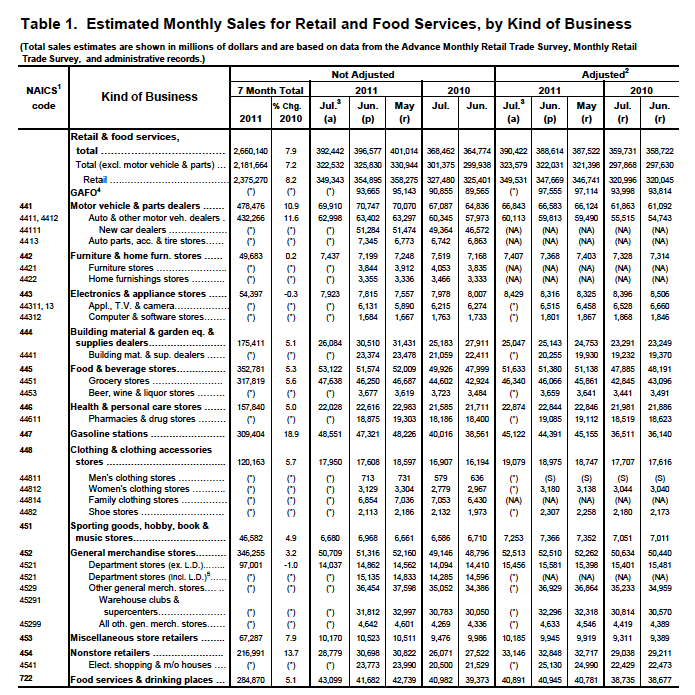 Well, two thirds of the increase in retail sales are from food and gas. That surely can give the bulls a reason to believe the consumers are spending (and laugh at last month consumer spending contraction). From the technical point of view, one has to look at the lows of this and try to see if there is a point if short term low is in. 1100 is strongly bought. We have had higher lows and higher highs through the week. Unless some catastrophe returns again, we are going through some consolidation period for muddle through OpEx. I expect next week's Empire and Philly to be highly disappointed (export collapsed as reported yesterday). But not sure if they can push the market like this week. But, look at the non-store retailers, 13.7%. Wonder how much is iPads. Cars – channel stuffing; food, gas and build. matl's – inflation. Non-essential stuff like furniture and in-store electronics not looking good. Seems a positive close for the bulls. 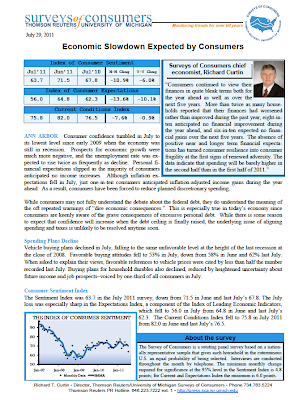 They calmed the market and let people feel the sky is not falling, beating back a dismal consumer sentiment. 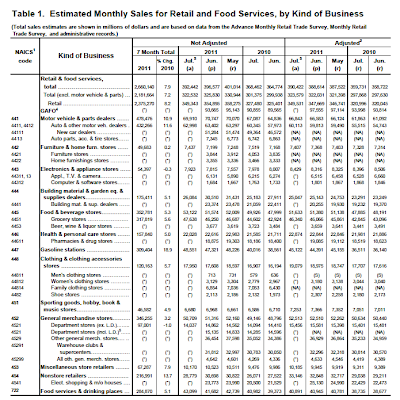 Retail sales continue to amaze me, though we know it is not inflation adjusted. Interesting question, Timer. I really enjoyed Pebble's comparison to the 2007/08 chart. It's gotta be somewhere around the 12th day of Christmas – the last day of the party. At least I'm taking down my Christmas tree lights tonight. Referencing the 2007/2008 chart, what day is today ? Re gold, that makes sense. Thanks for pointing it out. Nope. I think we go down here. 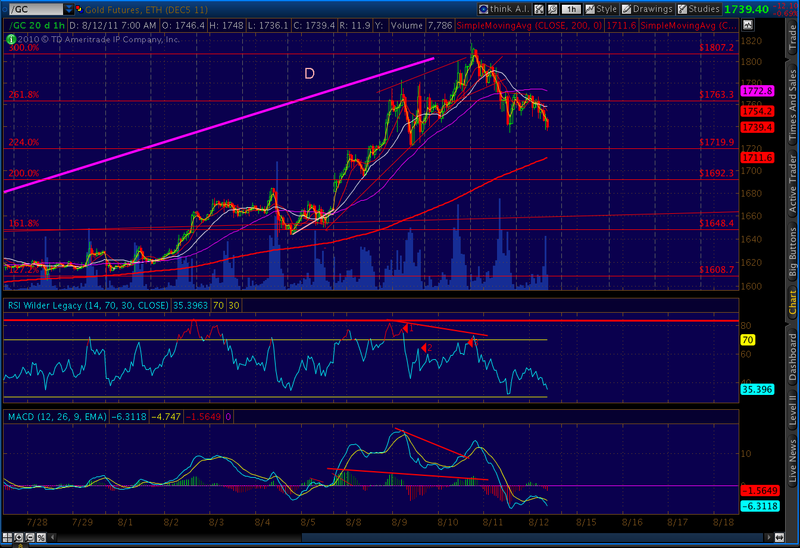 Do you see we can go up to 1250 on this bounce? Looks like we break out the triangle to the brave upside.